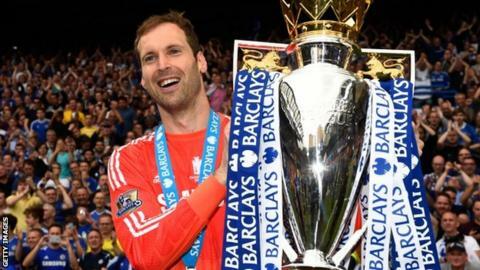 Chelsea are open to offering former goalkeeper Petr Cech a role at the club after he retires from playing at the end of the season. The Arsenal keeper, 36, announced his retirement on Tuesday. He spent 11 years at Chelsea where he won 13 trophies, including a Champions League and four Premier League titles, before joining the Gunners in 2015. Chelsea are keen to maintain a strong association with former players who helped bring huge success to the club. Former midfielder Joe Cole currently works at Chelsea. Cech joined Chelsea in 2004 from Rennes and has a close bond with the west London club, where he set a club record of 228 clean sheets in all competitions. The former Czech Republic international lives close to the training ground in Surrey and also has a good relationship with owner Roman Abramovich, who helped sanction his move to London rivals Arsenal when he was second-choice behind Thibaut Courtois. The Times reported that Cech could be offered a coaching or ambassadorial role. It is understood to be too soon to say what role Cech would take, but he knows Chelsea want to use his services. After announcing his retirement, Cech said: "I am looking forward to seeing what life holds for me off the pitch. "Having played 15 years in the Premier League and won every single trophy possible, I feel like I have achieved everything I set out to achieve. "I will continue to work hard at Arsenal to hopefully win one more trophy this season."